Life With Archie, the magazine-format comic telling alternate-future stories of Archie’s marriages to Betty or Veronica, is apparently quite the success, so much so that today Archie Comics announced a second magazine title: Veronica & Betty. 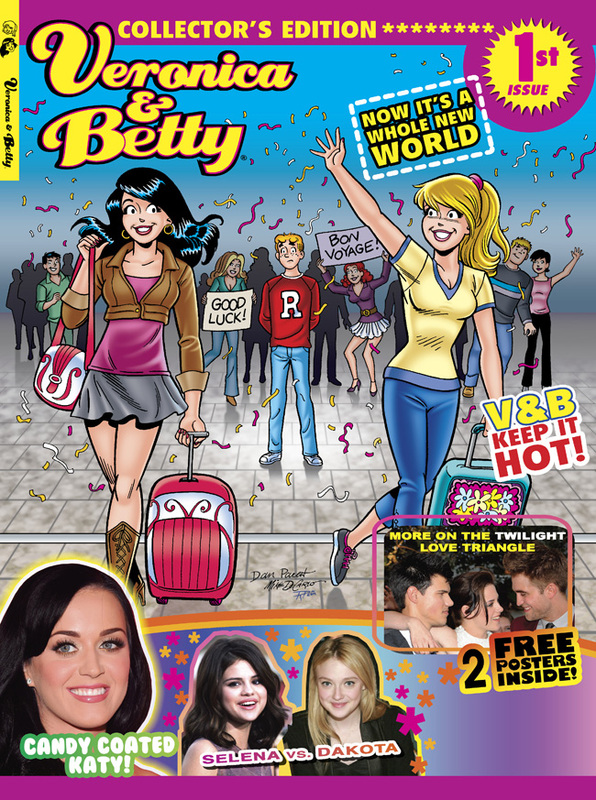 The glamour and excitement of VERONICA & BETTY magazine is set to be written by famed ARCHIE WEDDING and LIFE WITH ARCHIE writer Michael Uslan. The venerable fan-favorite writer will once again be tapping into the essential Archie questions and setting “VERONICA & BETTY” in an entirely new light. Illustrated by Archie Comics superstar Dan Parent, the new ongoing story will switch back and forth between Veronica and Betty’s travels across the globe and Archie, Reggie, Jughead, and the new girls turning Riverdale upside-down. Note the cover design, which follows Life With Archie in finding whatever excuse possible, no matter how tenuous the connection, to put pictures of currently popular stars on the cover. I feel sorry for kids who buy the issue really wanting to know something about the “Twilight love triangle” or Katy Perry — likely there’s maybe one page inside saying something like “Veronica loves listening to Katy”.